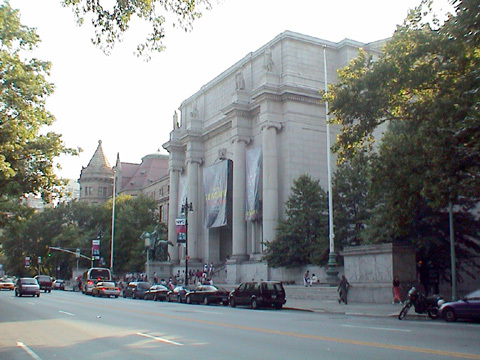 The American Museum of Natural History is one of New York City's most important and popular institutions and surprisingly it occupies only a fraction of its own park, known as Manhattan Square, that stretches along Central Park West from 77th to 81st Street. It was founded a year before the Metropolitan Museum of Art, which stretches along Fifth Avenue from 80th to 84th Streets. The Metropolitan Museum, however, is inside Central Park while the American Museum of Natural History is across Central Park West from the park. At one point in their early histories, plans were proposed to create a grand boulevard through Central Park to connect these great institutions, but such plans were never implemented although there is a transverse automobile road from 81st Street and Central Park West to Fifth Avenue and 79th Streets. Both institutions have expanded significantly over the decades, and are so large that it is almost impossible to see most of the exhibits in each in one day. 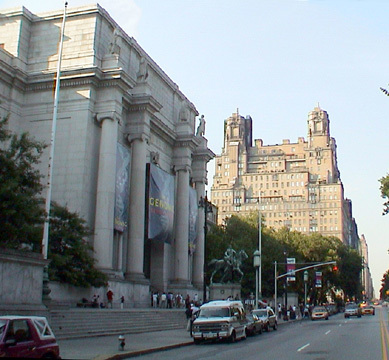 "When the first building of the American Museum of Natural History was completed in 1877, designed by Calvert Vaux and Jacob Wrey Mould, it was far and away the most prominent building on the West Side. The idea for the museum was conceived by Albert Smith Bickmore in 1860 while a student of Louis Agassiz at Harvard's Museum of Contemporary Zoology, at the time nation's foremost such institution. After the Civil War, Bickmore began to approach rich New Yorkers about his idea, and in December 1868 eighteen men signed a letter to the Commissioner of Central Park requesting a building site. Also in 1868, an abortive attempt was made to create a Paleozoic Museum on the west side of the park near Sixty-third Street. Intended as an exhibit of full-scale restorations of extinct creatures similar to one the painter and sculptor Benjamin Waterhouse Hawkins had undertaken in London's Crystal Palace for Sir Richard Owen, the English paleontologist who had coined the word dinosauria, the New York version, as conceived by Andrew Haskell Green, was to be based on prehistoric American subjects. But Green's enthusiam for the project was not matched by one scientist, who denounced the plan as a 'gloomy and half subterranean receptacle for restorations, a sort of fossil catacombs wherein the visitor, suppressing his dismay and encouraging his understanding, would wander about through shapes of pre-Adamite existence, and escape again into the light of day like Marcellus and Bernardo, 'distilled almost to jelly with the act of fear.' But according to the historian Douglas J. Preston, the plan for a giant, iron, vine-covered framework carried on iron Classical columns 'would have been rather spectacular, an extragance appropriate for New York.' Hawkins came to the United States and began a search for fossils. Delighted to learn that a mold of the Hadrosaurus, which had been dug up in Haddonfield, New Jersey, in 1858, had already been cast, he decided to make it the centerpiece of the museum, showing it being attacked by a carnivorous dinosaur, Laelaps, while nearby two others of the same species feasted on the corps of another Hadrosaurus. Foundations for the museum were laid, but Boss Tweed, unable to find a way to profit from the new venture, made it a political target and halted construction in 1870, plowing over the substructure and then arranging for the vandalization of Hawkins's studio. Plans for Bickmore's natural history museum solidified in 1869, when, joining forces with the newly founded Metropolitan Museum Association, the trustees of what had recently been formally organized as the American Museum of Natural History successfully petitioned the state legislature to authorize the construction in the park of homes for the Metereological and Astronomical Observatory, the American Museum of Natural History, and an art museum. Amazingly, at the age of thirty, Bickmore found himself superintendent of a new museum that promised to rival, if not exceed Harvard's zoology museum. Once established, the new museum contented itself beginning in 1870 with a home in the State Arsenal, still the designated site of a relocated New York Historical Society.....There was some ironic justification to this: once home to part of the park's menagerie, the State Arsenal's halls remained filled with scents of living nature. But historical association was not strong enough to overcome the building's limitations, and in 1871 the new museum secured the Manhattan Square site for itself after separating its governmental funding from that of the Metropolitan Museum of Art....One of the few open spaces provided for in the Commissioners' Plan of 1811, Manhattan Square was added to Central Park's landsw in 864, when it was slated to be home to the zoo. The site was isolated, and, as Bickmore later recalled, 'most desolate and forbidding. There was a high hill at the north east corner...and in the north west corner another hill of solid rock rose much higher than the elevated railroad station....In the southern and central part of the square, just where the first section of our builing was to be erected, was a third hill, whose crest rose as high as the ceiling our present Hall of Birds. As I sat on top of this rock, the surrounding view was dreary and my only companions were scores of goats.' Vaux and Mould's Ruskin-inspired Gothic design, no doubt intended to complementand balance their Metropolitan Museum across the park, was, like their design for that institution, conceived on a grand scale. The master plan proposed four quadrangles bounded by galleries linked at their intersections by pavilions. All in all, the museum would be 850 feet in its north-south dimensions and 650 feet running east-west, covering an area of some eighteen acres, an expanse two-thirds larger than that enjoyed by the British Museum. 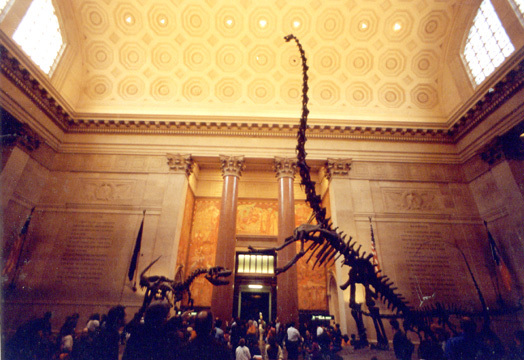 In fact, as planned, the American Museum of Natural History would have been the world's largest museum and the largest building on the North American continent....Despite the niceties of Vaux and Mould's design, the disintegration of their partnership led the trustees to hold a competition (1888) for a revised master plan, leading to the construction of the principal entrance pavilion facing Seventy-seventh Street. Competing were R. H. Robertson and J. C. Cady. Cady was selected. Robertson's Romanesque-inspired scheme honored the master plan. Cady's design was bolder and simpler, but it too followed the master plan...."
"The most conspicuous monument of the West End's Cosmopolitan Era was the American Museum of Natural History, founded in 1869. In 1874, when the middle-class residential character of the West End was still a matter of speculation, the museum laid the cornerstone of its first permanent home on the site of Manhattan Square. The square had been included in the Commissioners' Plan of 1811 and was later intended as an extension of Central Park, it was an obvious site for the new museum. In 1890 Josiah Cleveland Cady of Cady, Berg & See completed a section on Seventy-seventh Street of a vast new master plan which called for a square building linked at the center of each side to a monumental central tower. Cady's façade was a rigorously symmetrical five-part composition with twin towers flanking a central block and terminal pavilions whose corner turrets were capped by conical roofs and ringed with heraldic eagles. The vigorous massing and the use of both rock faced and smooth granite of a warm, red tint enlivened what was at the time the longest façade in New York. Cady's decorative details and turrets, finials and towers lent the museum baronial splendor and a somewhat martial air." "The museum was founded in 1869 when, in the wake of Darwin, Mendel, and a host of other pioneer naturalists, public interest in the natural sciences was at its peak. Architecturally, however, it lagged behind the times. Its first wing, built in 1874-77 according to the Ruskinian Gothic designs of Calvert Vaux and Jacob Wrey Mould, soon seemed old-fashioned in the wake of Richardson's Romanesque Revival. In 1890 the museum commissioned Josiah Cleveland Cady to design a new master plan but by the time Cady built his superb 1892-98 Romanesque facade on Seventy-seventh Street, the American Renaissance had already taken hold of the public's imagination. Cady's plan called for four such facades filling Manhattan Square, and a tall central tower. 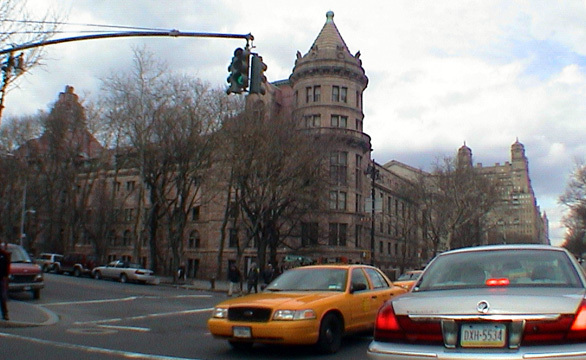 In 1908 Charles Volz built part of the Columbus Avenue wing, but by 1911 the museum, unwilling, or unable, to continue Cady's lush rusticated stonework any further, commissioned Trowbridge & Livingston to prepare a simplified design rendered in the same soft pink granite of which the Central Park West elevation was built in 1924. The new work was uninteresting but tactful, and as Mumford wrote, 'Nothing short of positive genius would have justified a complete departure' from Cady's vocabulary. In the 1920s the museum seemed to be searching for a way to intrigue a public for whom Darwin's revelations no longer seemed as interesting as Freud's. Displays of stuffed specimens in glass cases gave way to elaborate, psychologically compelling dioramas, and the Theodore Roosevelt Memorial offered the museum an opportunity to capitalize on its namesake's charisma, on the association he produced in the public mind between natural history and the strenuous life, on a patriotic appeal, and on sheer architectural display. In 1924, Governor Alfred E. Smith appointed a commission to erect the memorial at the center of the Museum's Central Park West frontage (a proposal first broached in 1920, a year after Roosevelt's death). Roosevelt had been a prime supporter of the museum, his widely publicized safaris had done much to keep it in the public eye, and his father had brought together the original investors. A design competition was organized among Gordon & Kaelber; Edward B. Green & Son; J.H. Freedlander; Helmle & Corbett; H. Van Buren Magonigle; York & Sawyer; Trowbridge & Livingston; and John Russell Pope. According to the program, the memorial was meant to 'symbolize the scientific, educational, outdoor and exploration aspects of Theodore Roosevelt's life rather than the political and literary.' It was to be 'harmonious with and embody the ideals, purposes and plans' of the museum 'to which Theodore Roosevelt devoted the early and closing years of his life.' And, finally, it was to conclude an 'intermuseum promenade connecting the eastern and western portions of the city' across Central Park; the memorial was therefore to 'project boldly in front of the central part of the museum building in such a manner that when seen in perspective...it will appear to rise above...the museum.' The promenade, ruthlessly slicing Central Park in half, would have emerged on Fifth Avenue just south of the Metropolitan Museum. It was a transparent attempt to advertise the museum at the park's expense. The conflicting demands of the program resulted in rather disparate solutions. Helmle & Corbett proposed a giant, vaguely Byzantine exedra framing a memorial column; an effective conclusion for the promenade, it connected stylistically to the old museum but would have hampered circulation through the galleries. Trowbridge & Livingston submitted a variation of the entrance proposed in their earlier master plan; a monumental granite box punctured by three arched entrances, it was sympathetic to the existing fabric but failed as a convincing memorial. John Russell Pope won the competition by ignoring both the style and material of the original building, and thinking of it purely as the climax of the proposed boulevard. His memorial consisted of a triumphal arch rising sixty feet from a base and flanked on either side by granite columns supporting the heroic figures representing different phases of Roosevelt's life. A simple, boldly scaled parapet wall crowned the composition, forming a high attic. From the street, a 150-foot-wide flight of steps led to a broad terrace where Earle Fraser's equestrian statue of Roosevelt was placed on a high pedestal. In a last great display of sculpture integrated with Classical architecture, the base of the building and the low walls that defined its forecourt were adorned with a magnificent frieze. The twelve panels of the 126-foot-long bas-relief were modeled by Edward Field Sanford Jr., of Pope's office, and carved by James L. Clark. Depicting animals 'in which Theodore Roosevelt had been interested' - but only those 'which also had an innate dignity suitable to the building' - the reliefs were jealously supervised by the museum staff to ensure their anatomical accuracy; 'at one stage of the work a grizzly was chained within a few feet of the sculptor for the study of head formation.' Inside was a 67-by-120-foot hall whose shallow, coffered barrel vault rose 100 feet above the floor. By the time the memorial was completed in 1936, its monumental Classicism that seemed to emerge effortlessly from the more primitive, rocklike mass of Trowbridge & Livingston's facade was seen as irrelevant by Mumford, who only taking notice of it in construction, deemed Pope's masterpiece 'the latest piece of Surrealist architecture....Today one can swallow it as sheer ghastly fantasy....In a year it will be finished, and then it will not even be funny.' 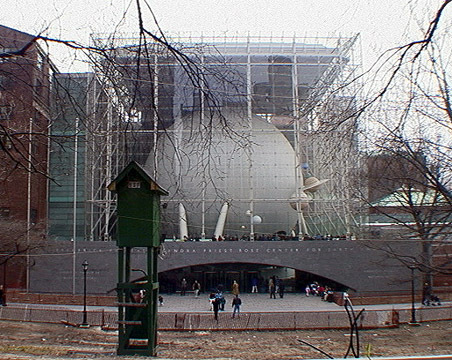 In 1935, the Museum of Natural History added the Hayden Planetarium. Located well within Manhattan Square, it seemed by virtue of its siting and its forceless red brick mass to signal the abandonment of plans to fill the museum's allotted land and its willingness to shrink from the grandeur of the museum itself. Designed by Trowbridge & Livingston, the building was most interesting at night, when batteries of concealed floodlights cast an eerie glow on its copper dome." "Its first collections were housed in the Arsenal building in Central Park. The cornerstone of he first among the present structures was laid in 1874 by President Grant, and the museum was formally opened by President Hayes in 1877. The museum's architecture is unhappily marred by a gross disparity of styles. The first building, facing Seventy-seventh Street, designed by J. C. Cady and Company, is a good example of the robust use of stone as structural material, a use developed by Richardson and his followers in the years before the Chicago Fair of 1893. The entrance on this side is vigorously indicated by the expressive massing of the dark salmon granite masonry and a great monumental carriage-way. It leads directly into the older Memorial Hall with its busts of early American scientists and temporary exhibits. Later wing additions by Trowbridge and Livingston are in general conformity with the older part, but flatter and less positive in treatment. The Roosevelt Memorial building facing Central Park West, completed in 1936 from designs by John Russell Pope, has, however, occasioned much adverse comment for its lack of relation to the adjoining structure and its pretentious Roman style. Nor have the murals in the high-ceilinged Memorial Hall on the second floor by William A. Mackay, been too well received, the general impression being that their design is weak, and that the depiction of incidents from the life of Theodore Roosevelt lacks imagination. On the other hand, the Hayden Planetarium, which is connected by a corridor with the Roosevelt Memorial, is among the most interesting examples of modern functional architecture. The architects were Trowbridge and Livingston. Particularly notable is the imaginative design of the Hall of the Sun, on the first floor, were form, light and color have been ably handled." "A major renovation of the American Museum of Natural History, one of the Upper West Side's greatest architectural landmarks, as well as one of the city's most cherished public institutions, was proposed in 1942. One year earlier, Park Commissioner Robert Moses, who never lost an opportunity to take a swipe at New York's intellectual establishment, had attacked many of the city's museums, including the Museum of Natural History, saying they were 'musty' and 'exclusive,' and had called for extensive physical and administrative changes. Acting with the approval of the museum's board of trustees, the city engaged Moses's longtime collaborator on Park Department projects, Aymar Embury II, to remodel the building; acting with the approval of the Park Department, the museum trustees in turn hired the architect Eliel Saarinen to advise them concerning Embury's preliminary proposals. Embury was to pay the museum $1,000 out of his fee for preparing preliminary plans to cover Saarinen's fee; he was to pay the museum an additional $5,000 to compensate Saarinen after completion of final plans. Embury called for the complete transformation of Cady, Berg & See's robustly articulated Romanesque composition of 1890, which extended along Seventy-seventh Street between Columbus Avenue and Central Park West. Saarinen immediately objected to the basic proposal, arguing that instead of making the substantial financial investment required to remodel what he considered to be an essentially unworkable structure, the museum should erect a new building sometime in the future. Some members of the museum's board considered Saarinen's idea impractical and strongly urged revamping the existing building, but the museum kept open the possibility of retaining the Seventy-seventh Street facade as it was and reallocating the allotted funds for new construction on the northwest corner of the site, bounded by Columbus Avenue and Eighty-first Street. The museum subsequently decided to pursue the remodeling option. Embury proposed a highly reductivist design calling for the removal of the corner towers that broke up the skyline and helped articulate the facade. He also proposed to strip the facade of all its details and reorganize it, so that above a windowless two-story base housing exhibits, punctuated only by a symmetrically placed entrance, would be more floors of offices lit by vertical strip windows. In response to the proposal, A. Perry Osborn, acting president of the museum's board of trustees from 1941 to 1946, said, 'I do not like the innumerable Greek temples that have sprung up all over Washington nor many of the copies of old Gothic buildings that dot college campuses. I particularly dislike the brown granite pseudo fortress that composes the South facade of our Museum. After all, a fortress was designed to repel people, not attract them....I think Embury has hit upon a simple, style-less type of architecture that looks very enduring to me.' Saarinen was more critical, writing to Embury that the design 'although good in proportion and mass distribution, is rather austere.' If Saarinen was qualified in his praise, many observers simply disliked the proposal, which was publicly released in January 1943. Despite widespread and virulent opposition, the museum administration backed Embury's proposal on functional grounds, saying it would significantly improve both exhibition and storage facilities, and on aesthetic grounds, claiming it would serve as an effective element in an overall composition dominated by John Russell Pope's rigorously Classical New York State Theodore Roosevelt Memorial (1936), which now served as the museum's principal entrance on Central Park West. In a letter to Albert E. Parr, the museum's director, Robert Moses, usually a supporter of Embury, said, 'I was sure that you would run into criticism from old New Yorkers if the architects went too far with functionalism. Every now and then I have had to warn Aymar Embury about this, and he has always been good-natured about it. Saarinen is way over in that direction anyway. It is a thing to be careful of. Perhaps the conservatives are reactionary, but you can't get too far ahead of the procession in public work.' In the course of developing the preliminary plans, Embury and Saarinen diverged in their recommendations. Osborn invited Saarinen to submit an alternate proposal, but the architect refused, stating that to do so would be to enter into direct competition with Embury, overreaching his role as consulting architect and betraying his responsibility as a 'congenial member' of the architectural profession. Saarinen's 'tentative scheme,' he said, 'must by no means be considered a design-suggestion for the contemplated structure. It must be considered, only and alone, a design-analysis so as to enable the more intelligently, perhaps, to offer advice.' Whatever Saarinen's intent, some of his drawings were shown by Embury to Osborn and Parr. Saarinen called for the use of brick cladding, the incorporation of extensive fountains and reflecting pools, and the addition of entrance colonnades leading from Columbus Avenue to the museum's Seventy-seventh Street entrance and from Central Park West to the museum's Eighty-first Street entrance. While acknowledging the artistic merit of Saarinen's proposal, the museum's board of trustees endorsed Embury's design. In recognition of unanticipated costs accrued by Embury in the design process, and perhaps because of the conflict with Saarinen, the museum relieved Embury of his responsibility of covering the consulting fee. Though the museum was still officially committed to Embury's design in 1945, the controversial plan was never realized. In 1967, the museum's Seventy-seventh Street wing was designated a landmark." The authors' book provides illustrations of Embury's four facade treatments. Not only were they sterile, they also had far too much blank walls and the effect was "fortress"-like, or worse, prison-like. Embury's plan envisioned the full development of the park site, but in no way could it compare with the grandiosity and pomp of Cady's earlier master plan and it seemed better suited for Queens. The Cady master plan had considerable merit, especially the notion of a central tower, and hopefully it will always be referred to in future planning. 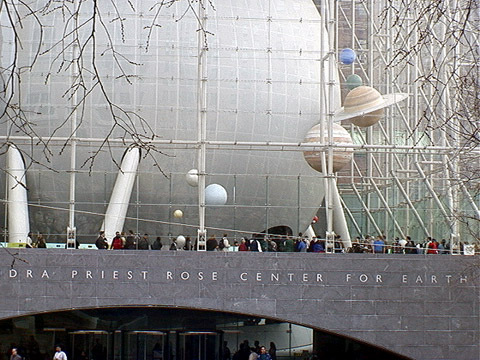 In 2000, the museum opened the Frederick Phineas and Sandra Priest Rose Center for Earth and Space, which incorporated a new Hayden Planetarium. It consisted of a very large glass box containing a huge globular structure with a spiral ramp. Designed by Polshek Partnership with Ralph Applebaum Associates as exhibition designer, the Rose Center is a very fine, very high-tech addition to the museum and the city. The museum is not only a fabulous educational facility but also an important research institution. The Rose Center is immensely impressive and one of the few superb works of modern architecture in post-World War II New York.